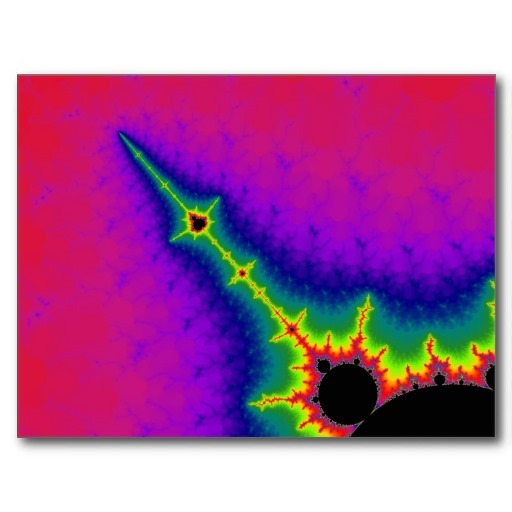 If you are new to Mandelbrot Explorer, this help page will explain how to get started with this computer program, and get you drawing colourful computer-generated images as quickly as possible. For guides to the Mandelbrot Sets and the family of Julia Sets, see the help topics here. The Mandelbrot Set is what is known as a “Fractal” image. Amongst other things, this means that you can magnify portions of it repeatedly, and you will forever discover new details that were not visible at lower magnifications. There are also endless ways to colour these images. Attractive pictures are produced by a process of selecting interesting areas to magnify, and choosing colour schemes carefully. When you start Mandelbrot Explorer, the main application window opens. See the help article Guide to the Main Window for full documentation of all the features here. For now, notice that the Mandelbrot Set is displayed in the middle of the screen, coloured black. Every other point is coloured white. The first thing to do is to set up a colour scheme that will make magnification interesting. There are some preset colour schemes available. Later on, you will want to learn how to control colours exactly; for this see the help topics on Colouration. For now, just select one of the built-in schemes, by clicking on the Bright Rainbow. Now you can start to magnify the Mandelbrot Set. Click on the toolbar button that pictures a magnifying glass containing a plus sign. This changes the mouse cursor, when you move the mouse over the Mandelbrot Set, to that magnifying glass picture. Double click anywhere in the image which looks interesting, and it will be magnified to fill the whole picture. You can carry on like this for as long as you like. When you have an area that you think looks really interesting, you may wish to save the image as a graphics file, set up your own colour scheme, or use some of the other features of Mandelbrot Explorer. Enjoy exploring the Mandelbrot Set!